Animals are often unpredictable and in order for us to survive we must be able to defend ourselves properly, in the case of a possibly violent encounter. Although many animals might appear to be tame, they can often resort to their wild tendencies. From the real way to defend yourself against man-eating sharks, to learning how to defeat a wild grizzly with your bear hands, here are 10 tips on how to defend yourself from animal attacks. Africanized honey bees were basically an experiment that’s gone wrong and now these deadly bees get the nickname of killer bees, because that’s what they can do. An ill advised hybridization between western and african bees which was supposed to yield more honey. Swarms of bees escaped the experimental facility and gained access to the southern united states. These bees are much more aggressive and are known to follow you for up to a quarter mile if you disturb them. They swarm in large numbers and just don’t like humans! Disturbing a killer bee hive can draw up to 2000 attacking bees all coming straight for you! So what should you do in the case of disturbing a killer bee hive? The first piece of advice we can give you, would be to run as fast as possible! Most humans can move much faster than bees can and if you were able to run a lap in gym class, that would be about the same distance as their attack range. Don’t try to swat them because this will basically only make them angrier and that’s not something you want to do. It’s also suggested that you should pull your shirt over your face to protect it. While this might expose your body to bee stings, you don’t want anything to happen to that moneymaker! Spring and summer is gator mating season and it’s during this time of year when they are the most aggressive and can bite harder than a great white shark! It’s also the time of year when people want to start enjoying natural bodies of water, where gators might be lurking;. Fishing and swimming are both fun activities at lakes, but you better watch out because some monsters might be lurking beneath the murky waters. How do you keep yourself from becoming gator bait? There’s an estimated 1.4 million gators living in Florida alone and encounters can be fatal. First rule should be to never try to feed the alligators and never try to swim in the same bodies of water with them. This seems like common sense but you’d be surprised. It’s better to run than to hide. 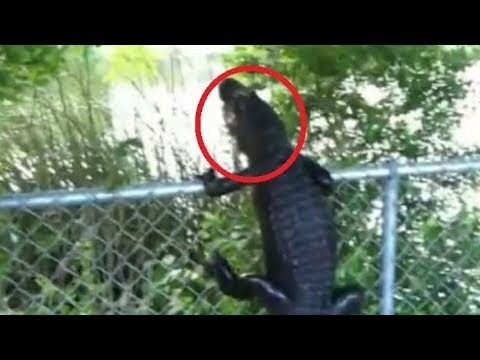 Alligator don’t typically run fast but they have been spotted climbing trees pretty well. If the running part didn’t work, alligators typically don’t want to fight you, despite their aggressive appearance. They generally don’t want to be grabbed and basically don’t like people. Your final tip would be to make as much noise as possible by yelling and trying to scare them off! Follow these tips and you should be able to survive the wilderness or at least the upcoming summer. When mankind is in mother earth’s backyard, she makes the rules and you better be prepared for what she has in store for you. Once you venture past the cozy confines of civilization, there are several kinds of animals you need to be ready to interact with. Especially in summer months near bodies of water, people will often encounter mosquitoes which can often carry deadly diseases. And if they don’t have a disease, they certainly will at least leave you with an itchy bite that will make you end up scratching yourself non stop.There are ways to avoid mosquitos and one of them includes wearing light colors . Mosquitos are more active during dusk and light clothing will confuse them when they’re searching for the horizon. Although light colors are good against mosquitos, bright colors will attract bees and wasps so choose your colors wisely. Others believe that eating garlic might help prevent you from getting attacked by mosquitos but the reason is unclear? Maybe because they’re like blood vampires?